After Dr. Rothfeld put me on a low starch diet, he suggested that I meet with Dr. Sarika Arora at the Rothfeld Center. I met with her today and she put me on a 28-day cleanse with even more restrictions - no dairy, meat or soy. I also have to drink half my body weght in water from a PBA-free bottle (no more Poland Spring Water bottles). Without revealing the actual number, let's just say that half my body weight is a lot of water every day!!! Dr. Arora started with a Bioimpedance Anaysis (BIA) which measured "body composition" including body mass index (BMI), the integrity of muscle cell walls and the amount of water in my cells (you want more water in muscle cells compared to fat cells). The procedure was easy and painless. The analyzer uses an imperceptible electric current through pads stuck onto my hands and feet. A software program translates the data into real numbers which are compared to standards based on my age. Dr. Arora's recommendation was based on my elevated CRP levels, which indicate inflammation in my system; my high blood sugar and triglycerides; being overweight; as well as my symptoms of sleep disturbances, fatigue, and muscle and joint pain (oh, my aching knees!). 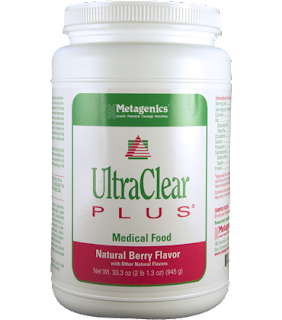 I need to detoxify my system, support my liver and eliminate any foods that trigger any kind of sensitivity (like dairy and wheat). Step 2 (days 7-13) is the detoxification. Select number of low-allergy foods with three servings a day of the medical food, UltraClear Plus. Step 3 (days 14-28) is the reintroduction phase. Foods previously eliminated are slowly reintroduced to the diet. This is only the first day, so I have no idea of how this will go. Some people have headaches, muscle aches and/or problems eliminating (if you know what I mean) as the body starts to detox and/or withdraw from caffeine or sugar. I'll keep you posted as I go through the detox stages.